engineered for strength and dependability in large casing diameters. 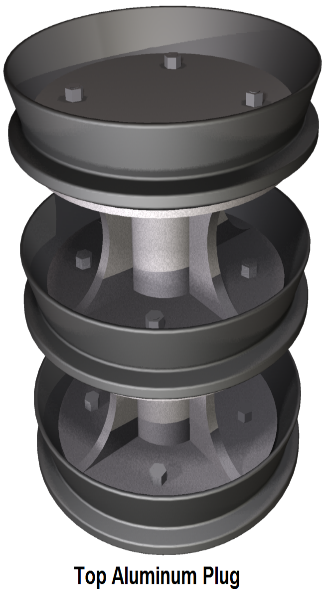 These plugs permit the use of conventional cementing methods in 16” through 20” casing sizes. The plugs feature three self-centering cups with wiping elements bolted to an all-aluminum core. The one-piece cup and wiper elements are made of 70 durometer natural rubber. Differential pressure across the plug forces both wipers and cups firmly against the casing wall to create firm wiping action throughout the length of the casing string. The all-aluminum core resists distortion from pressure in a deep well and gives support to long columns of either cement slurry or drilling fluid. The bottom cup design provides a positive shut-off when it seats on the landing joint. Aluminum plugs are PDC drillable. The strength of these plugs is superior to wooden plugs, which are often damaged by rough handling. Bottom aluminum plugs have a center hole 3 ½” in diameter through all the rubber cups and the top plate, and have a solid rubber diaphragm across the topmost cup, which will rupture when sufficient pressure is applied. Top aluminum plugs have all solid rubber cups and a solid top plate.